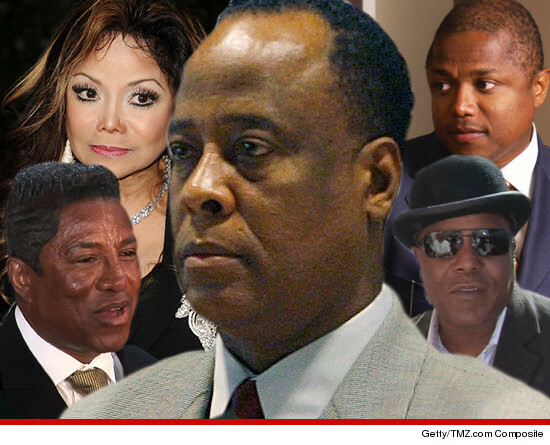 The Jackson Family Fears Dr. Conrad Murray will Kill Someone Else!!!!! Michael Jackson‘s family fears Dr. Conrad Murray will KILL someone else if he’s allowed to practice medicine again … Per TMZ. Sources close to the family tell TMZ … most of them are both offended and afraid at Murray’s bid to regain his right to practice. They can’t believe Murray would have a ghost of a chance to practice after being convicted and jailed for the death of Michael. The family scoffs at the notion that he didn’t harm anyone other than MJ during his 20 years of practice. They believe Murray acted so recklessly with Michael — partly out of greed and partly because he was a starf**ker. But the family will almost certainly not appear at any medical board hearing over Murray’s license. We’re told they’ve had more than enough of dealing with the good doc. Should Dr. Conrad Murray be banned from practicing medicine for life?